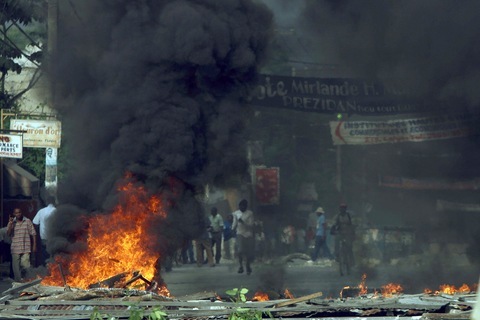 Protesters reportedly set fire to the headquarters of Haiti’s ruling political party Wednesday, and thousands took to the streets, forcing the closure of the Port-au-Prince airport in reaction to controversial election results. The protests began Tuesday night after the Provisional Electoral Council announced a runoff between two presidential hopefuls, including the government-backed candidate Jude Celestin. Blockades of tires were set on fire throughout the city, and Wednesday a mob of protesters blocked the entrance to current President Rene Preval’s private residence, Jacqueline Charles of the Miami Herald told the NewsHour. Demonstrators were chanting and holding signs in support of singer Michel Martelly, who did not make the run-off. Charles said there were also reports of rocks and bottles being thrown in riots in Cape Haitian, Haiti’s second-largest city. Opposition supporters have alleged ballot stuffing and vote buying affected the results. Celestin, considered the protÃ©gÃ© of current President Rene Preval, is now facing Mirlande Manigat, a former Haitian first lady, in the next round of elections. The Provisional Electoral Council said Tuesday Manigat had won 31.37 of the vote, Celestin 22.48 percent and Martelly close behind at 21.84 percent. Candidates needed at least 50 percent of the vote to avoid a runoff. The results went against observations by the National Observation Council, a European Union-backed election monitor, that suggested Manigat would likely face Martelly in the runoff. The U.S. Embassy issued a statement supporting the review of irregularities in the vote. “Like others, the government of the United States is concerned by the Provisional Electoral Council’s announcement of preliminary results from the November 28 national elections that are inconsistent with the published results of the National Election Observation Council (CNO), which had more than 5,500 observers and observed the vote count in 1,600 voting centers nationwide,” the statement read. These types of allegations are not unusual for elections in Haiti, said Charles, but they are acting as a flash point for anger built up from the January 12 earthquake and the continuing cholera outbreak.